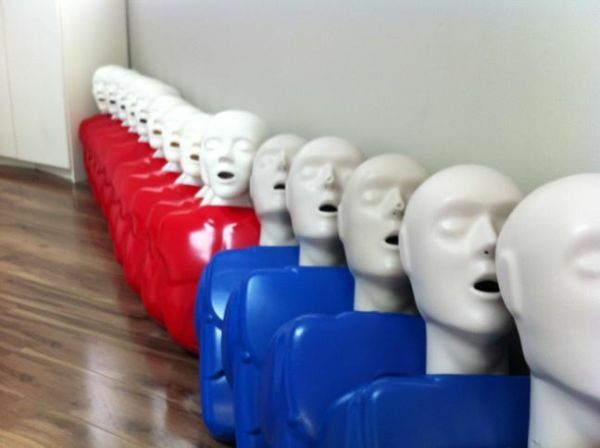 Many people in Surrey are required to have current first aid and / or CPR certification for employment or academic purposes. Vancouver First Aid Ltd is the largest, lowest priced and most experienced provider of first aid re-certifications in Surrey. Re-cert classes start as low as 30 dollars and customers can select from a wide range of different dates, times and locations. Participants will renew certification and learn the latest standards in cardiopulmonary resuscitation (CPR) as mandated by the ILCOR consensus of 2012. Participants can also register for other workplace required training such as food safe level 1, occupational first aid level 1, WHMIS and TDG training. Register for a course today using the contact details provided below. Sign Up for a Course in Surrey Today! Call centre hours are from 7 am to 5 pm Monday to Sunday. On-line registration is available 24/7. The main first aid training centre in Surrey is located in the Newton Business District. This provider offers courses Monday to Sunday and provide free parking and great access to public transit. View the map below for more location information. All fees are settled during enrolment. Some students are worried about expensive training fees because of additional expenses on top of the tuition fee. With Vancouver First Aid, there are no additional expenses. What you pay during enrolment is everything in total – tuition, taxes, certificates, registration (with St Mark James), and manuals. If ever you decide to drop out and not finish your course, you are still entitled to a full refund, as long as a three-day notice was given to the staff. Vancouver First Aid boasts one of the best training programs for first aid (including re-certification). The program is taken by a variety of people – students, workers, and health care providers. The program curriculum is comprehensive, covering a wide range of first aid topics. This provider has WorkSafe BC approved instructors or Instructor Trainers to teach all programs to assure quality that the students receive. These topics are covered using the latest training techniques and equipment. CPR-only programs are also available. There are three levels: A, C, and HCP. Each caters to a victim age group and type of trainee. All three categories teach students how to use automated external defibrillators (AEDs). Private classes are also available so be sure to inquire about them if you plan in getting private training or booking an instructor. Simply known as vertigo, BPPV is a sudden feeling of spinning due to positional changes – such as standing up too quickly. The episodes can be mild to intense and are triggered by specific changes in position. Even simply moving your head up and down or turning to the side in bed can trigger bouts of dizziness.